I am very excited as today as I finally got my first crop off Apple 'Charles Ross'*. I first planted it as a 1-year old maiden in 2006, so it's been six years to get to the first crop. And yes, those of you who know apples will be thinking "it should have cropped before now". This is true, but I think because we moved in 2009, and I dug up the tree to bring it with me, it then needed time to settle in to it's new home at Gwenfar's Lottie. I did actually get a couple of fruits growing on it last year, but they fell off before they were ready for picking. As you can see from the photo of the tree above, the poor thing has taken on a bit of a lean to one side. Yes, I need to stake it! I should have done this before now, and the above is proof why staking is important. I thinned the tree in June, when it had more fruit than the above photo, so I did something right... 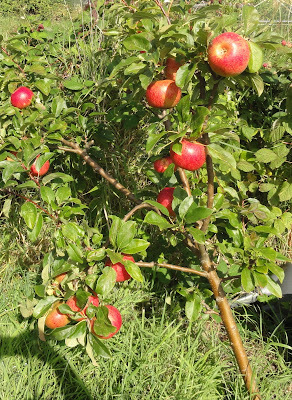 It clearly worked as the apples are a good medium-large size, as expected for this variety. 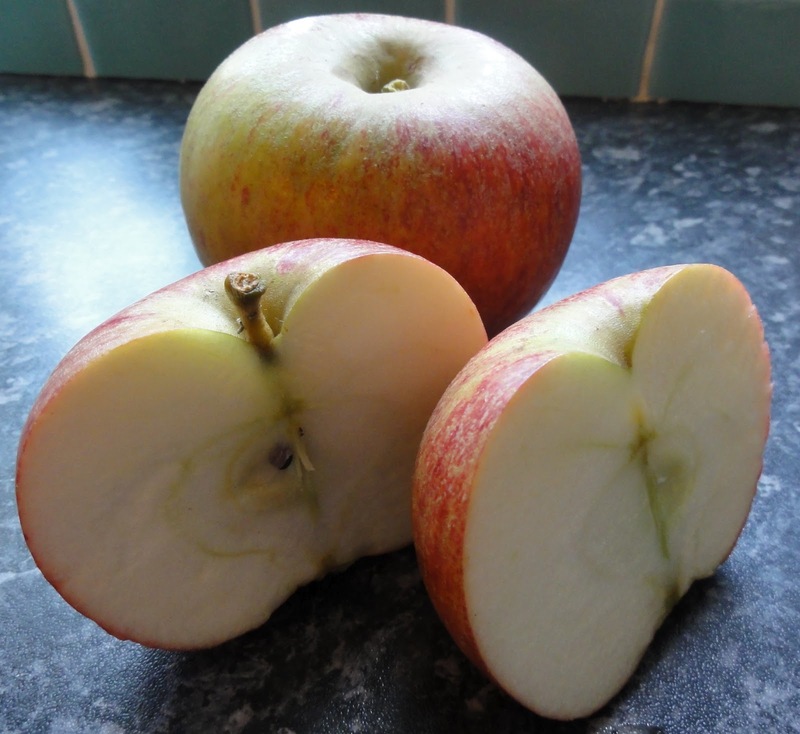 Charles Ross is a dual purpose variety, so can be used for both eating and cooking. We have done an eating test and did enjoy it. It has a sweet-tart flavour and is a crunchy, solid apple. We concluded that you can eat it fresh, but thought it would taste even better cooked. So Kevin threw together a really simple dessert. 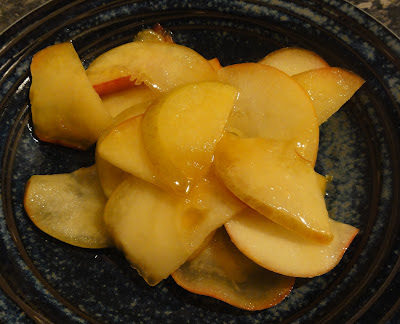 Sliced apples (with skin), cooked in butter and golden syrup until the apples are soft and the butter/syrup is bubbly, then serve. Add some cream to be extra decadent. The result - delish! 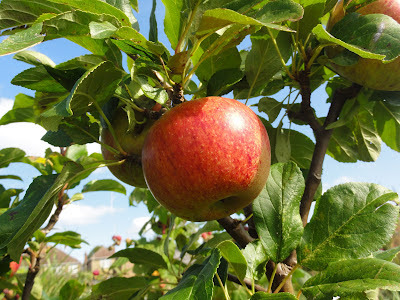 Although a dual purpose apple, I suspect we will mainly use this as a cooking apple. It held together well when cooking, and its sweet-slightly-tart flavour makes an excellent dessert. So, was it worth the 6-year wait? You bet! *1-yr maiden, on M26 rootstock, purchased from Walcot Organic Nursery. Super post. Just the thing for an overcast Sunday Morning. 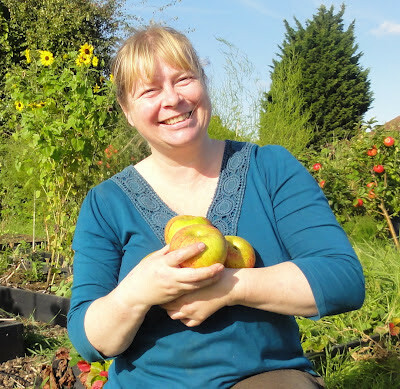 Glad to hear about your good Apple crop, well done. Its not been a good year for a lot of fruit this year. My 3 year old tree produced 1 apple only and only 2 Pears from my 3 year old tree Pear tree.